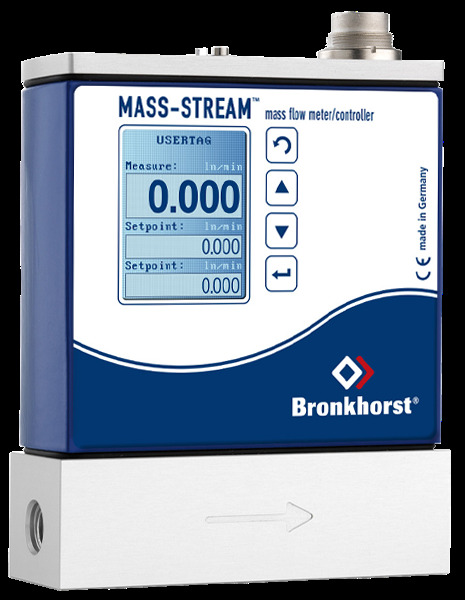 The mass flow meters and controllers consist of a metal body with a straight-through flow path. Two sensors are encased with stainless steel and protrude inside this bore; one is designed as a heater and the other one is designed as a temperature probe. A constant difference in temperature (ΔT) is created between the two sensors. 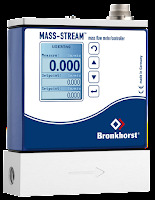 The heater energy required to maintain this ΔT is dependent on the mass flow. The working principle is based on King’s law of the ratio between the mass flow and the heater energy. That means the higher the flow, the more energy is required to maintain the chosen ΔT. Watch this video for an excellent visual understanding.